Home » Academics » Schools » School of Science, Engineering and Technology » Faculty » Dmitriy Khon, Ph.D.
During the last semester of his graduate studies, Dmitriy Khon, Ph.D., taught as an adjunct instructor at Bowling Green State University’s Firelands Campus. After earning his doctorate, Khon was an adjunct instructor at Owens Community College in Toledo, Ohio, during summer 2011. He then served as a visiting assistant professor at Gustavus Adolphus College in Minnesota from 2011-2012. 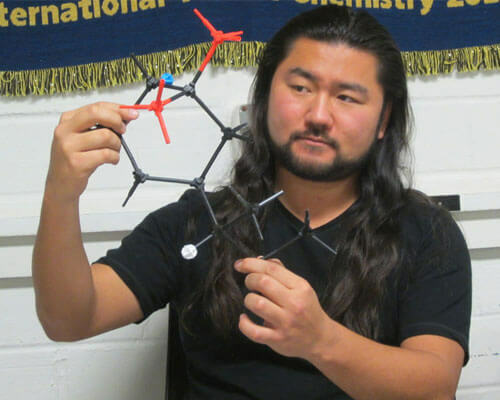 Khon joined the St. Mary’s faculty in 2012 and is responsible for teaching Organic Chemistry. Khon’s research interests are in the fields of nanochemistry and organic synthesis. His graduate studies involved synthesis of polycyclic aromatic hydrocarbons and plasmon-exciton interaction in metal-semiconductor nanocomposites. He designed and synthesized nanocomposites of different morphologies to study the interaction of exciton of semiconductor and metal plasmon and its dependence on spatial separation. His current research projects involve design and synthesis of semiconductor nanocrystal films for flexible Light Emitting Diodes (LEDs) and Photovoltaics.